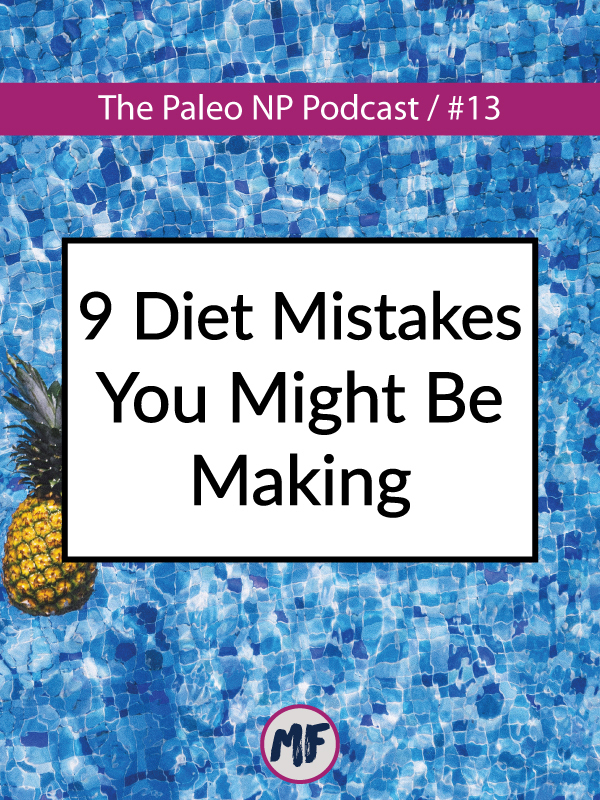 Welcome back to another episode of the Paleo NP Podcast! Before we get into this week’s show, I have a couple of announcements. So, first off I definitely have not forgotten about the ecourse I’ve been promising for weeks. However, what is happening is that I found that I had a lot more to say and the whole thing is just taking way longer than I wanted to, but in the end, you’ll win because there will be tons of information in it. So I am still working on that and I’ll be sure to share it as soon as it’s done! In the meantime, if you are looking for information about Autoimmune disease, I do have a free webinar that I recorded a few weeks ago that’s a super condensed version of all that I wanted to put into the ecourse. So it’s only about 30 minutes long and you can get access to that if you are interested. So, I’ll put a link in the show notes or you can go to bit.ly/mf5steps to get access. Something new that I’m into this week is naps. I used to be a champion napper. I’d come home from work and nap for 45 minutes or so before dinner. I’d nap in the middle of the afternoon on my days off. I’d nap on the weekends within hours of waking up in the morning. I was a good napper. Sometimes I would even take 2+ hour naps. Part of that, I’m SURE was related to being hypothyroid and having chronic fatigue and adrenal fatigue, but either way, things have changed over the past couple of years and I have really gotten out of the napping habit. Sometimes even when I want to take a nap, I just can’t. But over the past couple of weeks, I’ve been brining napping back. Again, I think it might be related to some of the health issues I struggle with, but that just makes it that much more important that I actually get the rest I need.So I haven’t had a multiple hour nap in awhile. I think the last time I slept for 3 hours in the middle of the afternoon was either while I was training for the half ironman triathlon I did this past year or while I was training for the 50K I did this fall. But lately I have found that a 45 minute nap after lunch is the perfect amount of sleep to get me back on track for a productive afternoon! Alright so this week we are talking about some of the biggest mistakes that you can make when it comes to diet. I spend a lot of time on the internet and I tend to surround myself online primarily with people who are not radically different from me. So mostly people who eat a real-food or Paleo diet or people who at least understand that food is important to your health. In my little internet bubble there are not a lot of people who talk about dieting or calorie restriction or punishing themselves for eating things that were off plan. So, anytime I come across that type of content, I’m always a little take aback because it’s just not a part of who I am and what I consume online. That being said, I wanted to share some things that I’m calling “diet mistakes.” Just things that I’ve seen online recently that really made me shake my head and I want to try to help change some of this thinking. Not all of these are specifically referring to “a diet” as in a short term thing you do to get a result, some of them are related to your overall diet, as in the food you eat every day. Now, some of these things are things that I’ve believed at some point in my life, and maybe you have too. Maybe you still believe them. And that’s ok. My goal isn’t to make you feel bad about any of this, it’s simply to help educate you to make better decisions going forward. Because aren’t we all just out there doing the best we can with what we’ve got? So the first thing I want to tackle is not eating enough. This drives me crazy. I cannot tell you how many times I see Facebook posts in various food groups that start with “My macros are 1200 calories per day,” or “I went over my 1200 calorie max,” or whatever. Let’s stop for just a minute and get some information straight here. 1200 calories is the recommended intake for kids ages 4-8 who are completely sedentary. So there is absolutely no way that a full-grown adult who is probably working out a fair amount or who is at least moving a little bit, should be eating 1200 calories a day. So, just let that sink in for a minute. Can you think of any reason why you should be eating the same amount as a sedentary 4 year old? Have you seen how small a four year old is? If you eat too low calorie for too long then you body thinks that it is in starvation mode and will actually start holding onto body fat. Now, I’m not saying that everyone out there has a weight loss goal, but in my experience, weight loss is a goal with most people (which is a whole different subject for another day). So not eating enough, and this is true particularly for women, puts your body under constant stress since it has no idea when or if it’s going to get another meal. This is a physiologic mechanism that is leftover from our hunter-gatherer days so that people didn’t die during times of scarcity. So if you aren’t eating enough, and especially when this is combined with exercise, your body is going to try really hard to become efficient at operating at that metabolic level, because your body is always trying to bring everything back into balance (called homeostasis). So your body attempts to continue to function when it doesn’t have enough calories, so what happens, through a process called metabolic adaptation, is your metabolism actually slows down so you burn fewer calories. This processes also messes with our hormones. Especially (again) in women. So healthy hormones generally indicate that you are fertile, but in times of scarcity, your body recruits the resources that it might normally put towards giving you your menstrual cycle and allowing you to be fertile, and uses those for other, more essential processes. So if you’ve ever lost your period, that’s your body’s way of telling you that you might not be eating enough (it can also be related to so many other things, but body fat and caloric intake are two biggies). So another diet mistake is being afraid of carbs and fat. I think that the idea that eating fat makes you fat has been pretty well debunked. I’ll be sure to link to a few good articles on this issue if you aren’t convinced. But the short version of the story is that fat is actually a preferred fuel source for your body, but it’s not the easiest source (carbs are, more on that in a minute), but eating more fat actually helps your body learn how to burn fat for fuel, especially when that fat is present when carbohydrate is not. This is the very basic principle behind the ketogenic diet (which I’m not going to get into in this episode). Eating fat doesn’t clog your arteries and it doesn’t make you fat. Especially when that fat comes from good sources such as coconut, coconut oil, avocados, fatty fish, and grass-fed meats. The current diet culture seems to have people terrified of eating carbohydrates. Which also won’t make you fat so long as you use them and don’t abuse them. I have worked with a LOT of women who have tried a keto diet because of the allure of fast and easy weight loss - “just don’t eat carbs and the pounds will melt off they say…” but what most keto folks are not saying is that women’s hormones are especially susceptible to the effects of going too low carb. I’ve seen everything from hair falling out to having a period every two weeks, to getting winded when they walk up the stairs, to not being able to sleep. And do you know what fixed every single one of those issues? Adding in more cabs. Now I’m not saying that keto and low-carb won’t work for you...but, I also don’t think that this keto craze should have us afraid of eating carbs. There’s also a huge difference between eating 100g of carbs in the form of a sweet potato and 100g of carbs in the form of a snickers bar or half a bag of jelly beans. Not all carbs are created equal, but don’t be afraid of carbs. Everyone is very different in the way their bodies react to certain carbs too, if you want to get super nerdy about your personal carb tolerance, you should get Robb Wolf’s book Wired to Eat because he has a whole carb testing protocol. If you don’t want to get that nerdy about it, just eat carbs from real, whole-foods sources, limit your sugar intake (because that’s usually the problem more so than carbs as a whole). If you don’t want to get super nerdy about this but you also feel like you don’t have a good grasp on what to eat, send me an email because I’d love to talk to you about this! The other thing that happens with carbs and fat (and I’m going to do a whole episode on macronutrients, so we will probably come back to all of this then) is that people tend to add more of one or the other but not adjust the other things and when they say “I added carbs back in and I gained weight” it’s usually because they forgot to cut back a little bit on fat and now they are eating more calories overall. And while I absolutely do not think that counting calories is important...the amount of calories you take in does matter at a certain point. This next point is brought to you by all of the people on the internet (specifically Facebook and Instagram) who are talking about combining all kinds of different restrictive ways of eating to get whatever results they are seeking. Specifically, there’s a book coming out by a fairly popular guy in the functional medicine sphere about eating Keto as a vegetarian, and to be completely honest, that was kind of the last straw for me...and really what prompted me to do this episode. I’m going to preface this by saying, and I really probably should have said this at the beginning of this episode, but it’s happening now instead, but I FULLY understand that there are people who eat keto because it’s literally saving their life, or they eat the only three foods that don’t cause an allergic reaction or autoimmune symptom flare-ups, or whatever. I’m not that naive to think that there aren’t people out there who have no choice but to eat an extremely restricted diet. I understand that. Those are not the people I’m talking about right now, because that’s not most of us. Now that we’ve gotten that out of the way...let’s talk about restriction. Restricting calories or food groups or categories of nutrients is not helpful. Yes, it absolutely can get you a temporary result or solve a problem, but it is not a long term solution. Let’s take the Whole30 for example. I love the Whole30 as a tool to learn about how food makes you feel and your feelings about food. It’s got a lot of good stuff packed into 30 days. But, it’s called a Whole30 for a reason because it is not a sustainable way of eating, because it’s too restrictive. So Whole30ing it for 3 or 6 or 9 months, will not actually accomplish the thing you think it’s going to accomplish. Will you lose weight? Yeah, probably. But you will also be borderline OCD from scrutinizing the label of every food item you pick up, you’ll either be super isolated because you haven’t eaten out with your friends in 6 months, or you’ll be so obsessed with the cravings for things that you can’t have that you feel like at any moment you are going to lose it and bury your face in an entire box of cookies. And if you think I’m making these things up, I am not. I am a member of several Whole30 groups on FB and all of these things have actually happened. Even Melissa Hartwig, the creator of the Whole30, says that it’s too restrictive to be followed for more than 30 days. There is also this tendency to want to combine restrictive ways of eating with other restrictive ways of eating thinking that it will get you results faster. Low-carb/Keto Whole30, AIP and keto, and I’ve even seen people ask about doing a low-fat Paleo diet. This combination approach has two issues - the first is that it brings the diet mentality into things that are not meant to be diets. I talked about accidental dieting in episode 7, so you can go back and listen to that if you want. This is especially true with Paleo, because it’s meant to be a template for a lifestyle, not a “diet.” And for things like Whole30 or AIP the goal is not to achieve any sort of aesthetic goal, but to heal your body and your relationship with food. Restriction in not good for your brain either. Willpower is a limited resource and the more that you have to exercise it the more likely you are to suddenly no longer be able to handle it anymore and go off the deep end. Or you can become so obsessive about these things and that’s not healthy either. This ties nicely into my next point which is that making weight loss your primary goal actually makes it harder to lose weight. I know. I’m insane and I have no idea what I’m talking about. Except, I do. So my first little rant here is that if you are trying to lose 10 pounds or less. Just stop. To be completely honest, these are very likely what I call vanity pounds, and it’s not worth ruining your long term health over. Your body weight, just like everything else in your body, fluctuates. And while you may really really hate those 10 pounds, chances are that they are not doing you any actual harm. The body aesthetics that are seen as beautiful or strong in our society are completely ridiculous. Six pack abs and a tiny waist are actually not achievable for most people (unless you are willing to lose your period and mess up your hormones to get them). If you are eating a well-balanced diet, exercising and appropriate amount, getting enough sleep, and managing your stress...your body will find where IT wants to be and forcing that to change can have negative consequences. But if you have more than 20 pounds to lose, there’s actually probably something else going on in your body and fixing whatever that is will allow you to lose weight down the road. It might be your thyroid, your adrenals, maybe you have an autoimmune disease, or a hidden gut infection. Whatever it is, finding that cause and healing it will help you drop weight down the road. Remember that our bodies like to be in homeostasis, so excess weight is usually the result of some other underlying cause. Also, if you have all your nutrition and lifestyle ducks in a row and still aren’t at a weight where you are happy, you probably need to have a little sit down with yourself and evaluate if you are comparing yourself to an arbitrary standard. We’ve already kind of covered this topic in the first point, but another mistake you can make when it comes to your diet is the idea of eating less and moving more. We’ve covered why eating less is not a good idea. It slows your metabolism down and can wreak havoc on your hormones. Moving more, especially when combined with eating less. If you are severely overweight, sedentary, or completely new to the idea of improving your health. Moving more and being mindful about what you eat CAN actually be helpful. Even if you exercise a ton, you could still probably benefit from moving more in general, but not necessarily by exercising more. Movement has a powerful impact on our health. So sitting at a desk all day and then exercising for 30-60 minutes isn’t actually the best approach. So, sure we could all move more, but not in the way that this message usually comes across. If you have been training for a while, this strategy really won’t work. As we’ve already talked a bit about, a severe calorie deficit (or what I will not refer to as, eating like a 4 year old), will actually work against you. And if you try and counteract it by training more and eating even less, you’ll find yourself with no energy and an ever expanding waistline - remember, you body has no idea that there IS actually plenty of food around, it’s stuck in the distant past and is under the impression that there’s no lions or tigers or bears to be found for miles. I fully recognize the look of horror on the faces of people when I tell them that they might actually benefit from eating more. Society (and all the people trying to sell you six pack abs and thigh gaps) has told us that eating more is wrong or bad. And the best place to start with eating more? Make sure you are eating enough carbs...and plenty of protein. As I mentioned before, I think that short term “diets” like Whole30 are excellent tools. But one of the biggest mistakes that you can make when you are following any sort of plan is to not learn from what you are doing and simply blindly follow whatever plan or advice is given. We are all very different and what works for you might not work for me (more on that in my next point), so if you just do a Whole30 because you want to lose weight and you don’t learn anything from your experience, you didn’t do it right. Ok, totally obscure Veronica Mars reference here “FYI, if the cuddling is the best part, he didn’t do it right.” Nope, no one else loves that show as much as me and has all the good one liners committed to memory? Cool. Well, moving on. Any time you do any sort of food plan, especially if it involves restriction of any kind, the goal should be to learn something that you can apply to your everyday eating strategy going forward. Because of this I also think that you should take a closer look at your motivation behind things if you find yourself revisiting the same restrictive way of eating time and time again. I’m going to use the Whole30 as an example again, but I’ve done exactly ONE true Whole30. I learned what I needed to learn from it (that I feel better without most grains, white rice isn’t really a problem for me, dairy can be my friend in small amounts, I’m a 3pm snacker and probably will be until I die, and so much more) and I have not gone back to that plan again. I do sometimes revisit the piece of it that are helpful (cutting out sugar, preservatives, dairy, and all grains) because I know that when I start putting too many of those things back into my diet too often I start relying more on convenience foods and less on nutrient-dense foods and I don’t feel great. The same thing with macro counting. I did that for almost 6 months while I was training for my first half ironman triathlon and I learned that it’s pretty helpful to track what you are eating in a high volume training situation because it helped me see when I was hungry because I truly hadn’t eaten enough vs when I was hungry because I was bored, or tired. But I don’t need to track my macros all day every day going forward. This also kind of ties back to having weight loss as your main goal. If weight loss IS your main goal (because it just is going to be for some people, I know that and I’m not going to stop you), then you need to eat a certain way to understand how it affects your body not “because so-and-so says that it’s going to help you lose weight.” So if you are eating low carb, the goal is to understand how carbs affect your body and even maybe to determine how many carbs you need to eat to feel good, but not that eating low carb is going to help you lose weight. So if you aren’t learning things from the plans or protocols that you are learning. You’re doing it wrong. Next up is doing what works for everyone else. This is a tough one, but if you follow what we just talked about and you seek to learn from each experience, this becomes much easier to avoid. Just because the entire internet is talking about how keto helped them lose weight, does not mean that it’s going to work for you. Especially if you are woman, and I am kind of ragging on keto here, but a truly ketogenic diet just really doesn’t seem to work for a lot of women. Anyway, the more you learn about your body and how certain things affect it, the easier it will be for you to figure out what works for you and do more of that and do less of the things that don’t work for you. This doesn’t mean that you shouldn’t try the things that are working for everyone else, but be aware that just because they worked for someone else doesn’t guarantee that they’ll work for you. This next point is brought to you specifically by the same post that sparked my “more restriction is better” outrage...yep, the vegetarian keto diet. There seems to be this widespread belief that a vegetarian or vegan diet is the healthiest diet. Now, I’m not denying that it works really well for some people, but what happens when you go around believing that veganism is the healthiest diet but you ARE NOT one of the people it works well for? Then you get stuck with horrible guilt for eating meat and feeling like it’s not the healthiest thing. And honestly I think the keto vegetarian thing comes from the idea that vegetarianism is the healthiest diet and keto is also really good for you (which we’ve already talked about how it’s not actually good for everyone) so if you combine them...and restrict more...then you’ve got a winning combo. But that’s not really the case. If veganism or vegetarianism makes you feel great, by all means, PLEASE do more of what makes you feel great. And I’m not trying to make you feel bad or guilty about any of the choices you are making about your food or your life, because I do believe that there are people out there who do thrive on a completely plant-based template. But we are all different and that doesn’t mean it’s the healthiest thing. I talk to so many people who say that they wish they could be vegan or they are thinking about becoming a vegetarian solely based on the idea that it is the best bath to health. Nutrition science is a messy, messy place and there is so much conflicting, confusing, and bad information out there that it’s HARD to determine what is true and what isn’t. Especially when so many of the people we trust (or think we should trust) are recommending outdated or unfounded advice. I saw an article recently, and I’ll try and find it again and link it in the show notes about how up to 80% of the medical advice given on TV shows had absolutely nothing to back it up. Also, in episode 8, I talked about how Paleo is actually a plant-based diet because the focus is on vegetables, so you can still be “plant based” and continue to eat meat. And again, I’m a huge advocate for doing what works for you, because there really isn’t any one way of eating that is right for everyone. So if whatever you are doing is making you feel amazing...then don’t change anything BUT if you are making your decisions based off of a Netflix documentary, an Instagram celebrity, the claim that broccoli gives you as much protein as beef, then you’ve gotten bad, outdated, or biased info, and you need to reevaluate your sources and your strategy. I feel the same way about keto, strict Paleo, or any other diet out there. None of these are the healthiest or the best diet, especially not when followed blindly. The last thing I want to talk about is guilt and responsibility. And this plays into a much bigger picture than I really want to discuss today, but it’s definitely applicable for this conversation. So often when someone suggests that a diet change might be a good solution for whatever problem you are trying to solve, I think people tend to feel threatened or offended and feel guilty because if diet is part of the solution, then THEY must have caused the problem by the foods they chose to eat. Now, this is much more of an issue when we talk about making dietary changes to improve health issues vs. eating an overall healthy diet. But for so many, it’s easier to just take a medication to solve the problem than it is to take a good look at your own diet and behavior. And it also seems (and this is purely anecdotal on my part) that the people who are the sickest and could benefit the most from some of these changes, are the people who are most resistant to the idea. And if you change your diet and any of the things that you have been struggling with get better, then you have no choice but to accept the fact that your behaviors contributed to the problem in the first place. Some of you are probably saying “well, of course your behavior contributed to the problem,” and others of you are probably thinking that there’s no way the things you have done have contributed to anything because you just lost the genetic lottery or this is just the hand you were dealt in life. I totally understand that it’s so much easier to just accept the fact that you have a disease and rely on medical professionals and drugs to treat you than to do any sort of internal work or soul searching to understand that your behaviors (whether you think they are good or bad or right or wrong) do have consequences. Now, that doesn’t mean that you need to feel guilty about any of this. And I am certainly not placing any sort of blame on you for this. However, I am encouraging you to accept responsibility for whatever it is you are trying to change going forward. It is possible to to be aware of and accept responsibility without any blame, guilt, or shame. Part of the poor dietary choices that we make that contribute to obesity and other chronic diseases are the same choices that millions of other people are also making, and that doesn’t make it right, but it’s part of our culture, which makes it harder to see where there might be room for better of different choices. And something that I am pretty adamant about with my patients and clients is that YOU and you alone are responsible for your health. No one else can fix your health issues. You can get help from other people, but at the end of the day every choice you do or don’t make contributes to your health or your illness and you are the only one who can change any of that. But again, accepting responsibility is not at all the same as being blamed for something and you absolutely should not feel guilty about it. Alright, that’s all for this week. That ended on a little bit of a deeper note than I had intended. But I think these conversations are really important - because the more we talk about this kind of stuff, the easier it is to make changes and feel good about them. Thank you so much for listening and if you have a question that you would like me to address, you can send me an email or submit it via my website - marthaflorence.com. And if you enjoyed this week’s episode or have enjoyed any of the other episodes, I would be super grateful if you would head over to itunes and leave a rating or a review. You can even do it straight from the podcast app on your phone! Thank you so much for listening and I’ll see you next week!